Under the Treaty of Versailles Germany had been allowed only one battalion of mountain troops or “Gebirgsjäger” plus some ancillary mountain companies, however in Austria nearly half the standing army were mountain troops 6 full mountain regiments and 4 independent mountain battalions. Thus with the Anschluss, Germany was able to field 3 full Gebirgsjäger Divisions at the start of the war. As the war progressed more Gebirgsjäger Divisions were raised, by 1944 there were 9 Heer and 4 SS Gebirgsjäger Divisions as well as numerous Jager or light infantry divisions. Gebirgsjäger fought on every front and most major campaigns even with the Afrika Korps. Erwin Rommel served in the AlpineKorps in WW1 as a lieutenant with distinction. Pictured here is a Heer Gebirgsjäger mid to late war. He wears a M36 feldgrau wool tunic and trousers. Over this he wears a tan reversible anorak. His headgear is a Bergmütze mountain cap with snow goggles. Over his shoulder is a climbing rope with carabiners & pitons. Puttees are worn at his ankles to secure his trousers. On his back our soldier wears a M31 backpack, his webbing is kept sparse to facilitate climbing with just K98 pouches, a water bottle and an empty bayonet frog. To assist climbing he has a piton hammer secured to his backpack and has a ice axe. His rifle is slung to the front to keep it accessible but leaving his hands free for scrambling over rocky surfaces. As the Gebirgsjäger were a variant of basic Heer infantry you can do a simple impression by altering your Heer impression with a Edelweiss badge on right arm and green piped shoulder boards. However I also intend to look at how you can push the impression further as time and money allows. Of course the Gebirgsjäger wore the standard M35, M40 or M42 helmets. However the iconic piece of Gebirgsjäger kit is the Bergmütze (mountain cap) higher than the M43 (which was based on the Bergmütze) and with a shorter peak it had the Edelweiss badge on the left and a T eagle on the front. 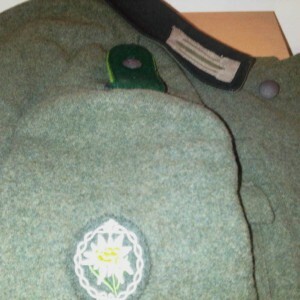 It could also have a divisional pin worn behind the Edelweiss badge although this was unofficial. This item of kit was cherished by the Gebirgsjäger and could be worn in battle especially at altitude where the weight off a helmet was impractical. A nice touch for the Bergmütze is to replace the 2 metal buttons at the front with Steinnuß buttons, made from the corozo nut these buttons are not cheap but can be found on Ebay for £10-£20 a pair. In mountain theatres snow goggles (Schneebrillen) are often seen around the Bergmütze or worn to protect the eyes from snow blindness or the wind. Gebirgsjäger wore the standard M36, M40 etc tunics, an Edelweiss badge was worn on right arm approximately 6″ down from the shoulder and the standard Heer chest eagle, Litzen (collar tabs) can either have grass green colour or be generic BeVo collar tabs (i.e. without Waffenfarbe). Shoulder boards should have grass green Waffenfarbe for infantry units. Gebirgsjäger had their own wide cut trousers (Berghosen) with a narrow taper, reinforced crotch a pronounced seam down the front and canvas or leather straps at the ankle. However standard M37/40 trousers will suffice, M42/43 are a closer match, M43 trousers were based on the Berghosen design. There are some pictures of Gebirgsjäger wearing Kniebundhose (trousers that come to below the knee) and long socks but this was not common. Another iconic piece of kit was the “Bergschuse” mountain boot with hobnailed soles and cleated edges and toes. Reproductions are available for around £200. A cheaper alternative is the Swiss boots with similar ironmongery attached, these come up on ebay for much less when you can find them. Standard low boots were issued and used in non mountainous terrain. Failing that suitable brown/black leather walking boots will suffice, when covered in mud and with puttees at the top few will notice. Jackboots/marching boots should normally be avoided. There are pictures of Gebirgsjäger with their own civilian walking boots. Wicklegamaschen (puttees) are worn wrapped around the top of the boot and bottom of the trouser leg secured by a buckle usually on the outside of the leg. 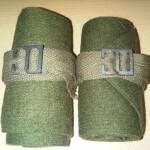 The puttees are wrapped clockwise for the right foot and counter-clockwise for the left. Originals/post war ones can sometimes be found on German Ebay or Australian short puttees are a good alternative (some replace the wrapping material with a grey fabric). Gebirgsjäger wore a great variety of winter clothing. 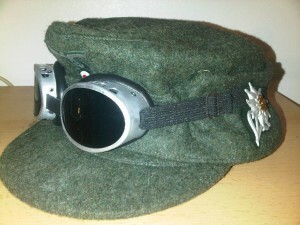 A unique item of clothing for the Gebirgsjäger was the reversible anorak. Usually reed green, could also be tan coloured, both reversible to white. Made of a triple layer rayon material it was wind and rain proof. The original anoraks had only 2 chest pockets, in 1943 the 3 pocket version was introduced. The 1943 version was issued with matching trousers, trousers can sometimes be obtained from Chinese manufacturers. Camouflage variants were also produced. 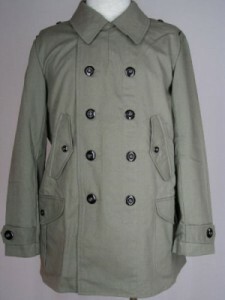 Another coat, the calico Windjacke (wind jacket) was only issued to 10% of Gebirgsjäger. It was double breasted and loose enough to be worn over equipment if desired. 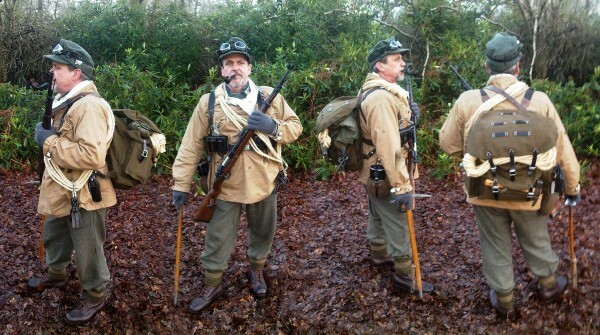 Standard M36/40 Greatcoats were also worn in large numbers. From 1942 the standard issue 2 piece reversible winter suit was also used on the Eastern Front. Initially gray reversible to white, these would later become available in splinter and when used as white a red coloured armband would also be worn for identification purposes. Improvised sheepskin coats and fur hats were also sometimes worn, even Ushanka’s are sometimes seen in use on the Eastern Front. Gebirgsjäger wore standard Heer shirts, either collarless or collard pullover shirts. However civilian check shirts also seem to have been popular. Gebirgsjäger also had to adapt to warmer climes of Greece, Crete and Italy. In Crete British shorts (Bombay bloomers) were captured and put to use. In Italy Heer and Luftwaffe tropical uniforms could be worn, sometimes mixed and matched with woollens. When wearing the baggy Luftwaffe tropical trousers, puttees were usually dispensed with. Gebirgsjäger used standard German webbing and ammo pouches. At high altitude all unnecessary kit was left behind, including a lot of the time the bayonet, sometimes an empty bayonet frog may be worn with just a canteen hanging from the belt. Everything else would be stored in the backpack or left behind. The water bottle should be the larger 1 litre bottle (similar to the medics bottle, but with the standard clip fitting rather than the shoulder strap). Otherwise kit was standard Heer issue. 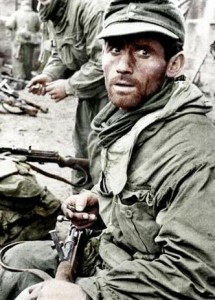 Of course webbing worn depends on the terrain they were fighting in, the standard Heer layout of webbing and kit will be more applicable to some theatres. 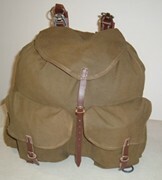 The standard issue backpack was the M31 mountain backpack, later the M44 rucksack was introduced based on the mountain pack design but available for issue to all troops not just Gebirgsjäger. Inside the backpack you would find: a groundsheet, blanket, wind cheater, spare shirt, spare pants, spare socks, balaclava, gloves, mess tin cutlery, rations, jewel stove, washing gear, candles or flash light, low boots, crampons, snow shoes, zeltbahn, climbing gear, compass etc. 5 colour coded bags were used to help store items in a tidy fashion. All told troops had to carry about 32Kg of weight, often while ascending 2000m. For airsoft I suggest filling your rucksack with bubble wrap! Post war backpacks of the same layout as the M31 can be obtained for about £25. They have canvas straps which need replacing with leather. Another nice touch is to add some climbing equipment if operating in a mountain theatre. Loops of rope hanging from the right shoulder to left of the waist with carabiners & pitons hanging from the rope complete the look, perhaps with an extra looped rope protruding from under the backpack flap and additional carabiners & pitons hanging from the leather straps on the backpack. 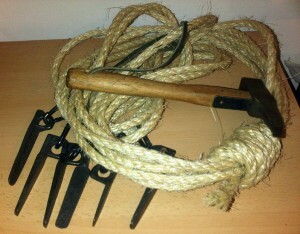 A piton hammer can be stuffed in the belt, hung from the rope or be tied to the backpack. Another iconic piece of kit is the ice axe – as well as an essential tool for Alpine climbing it also served as a walking stick. Stubai Austrian ice axes can be obtained from Ebay. Brades British issue ice axes are a similar design. For airsoft, the ice axe, ski equipment or crampons (Steigeisen) may be best suited for photo opportunities. As well as the usual Heer bravery, combat and trade badges/awards Gebirgsjäger also had the Mountain guide badge, worn by a Bergfuhrer (mountain leader) in enamel. This was a much coveted award that showed a very high level of competency in mountaineering, so like the Iron Cross etc best not worn as a part of every impression. The little seen Anti partisan badge would also be appropriate if representing a division who participated in such work. In the German Army although moustaches were allowed they were not fashionable and rarely seen however beards are sometimes sported by Gebirgsjäger in photographs. . Shaving was not required at high altitude by the Heer as it required the kit to be carried and water for the soap. Water was for drinking and cooking at that altitude and kit carried was for fighting and surviving. Also the commander of 5th Gebirgsjäger Division was one ‘Papa Ringel’ who famously sported a very fetching goatee beard. This may explain a more relaxed attitude within the mountain divisions to facial hair. Standard Wehrmacht small arms were used by Gebirgsjäger. Also though they made use of the Gew 33/40 shortened mountaineer rifle. Wicklegamaschen buckle: Sams Militariya ?